Settlers arrived in this area in the 1860s. Later they began quarrying its vast deposits of quartzite. East Sioux Falls, a rough-and-tumble quarrymen's town, began in 1887 and flourished for several years. The financial Panic of 1893 and technological change led to the demise of the local quarrying industry. 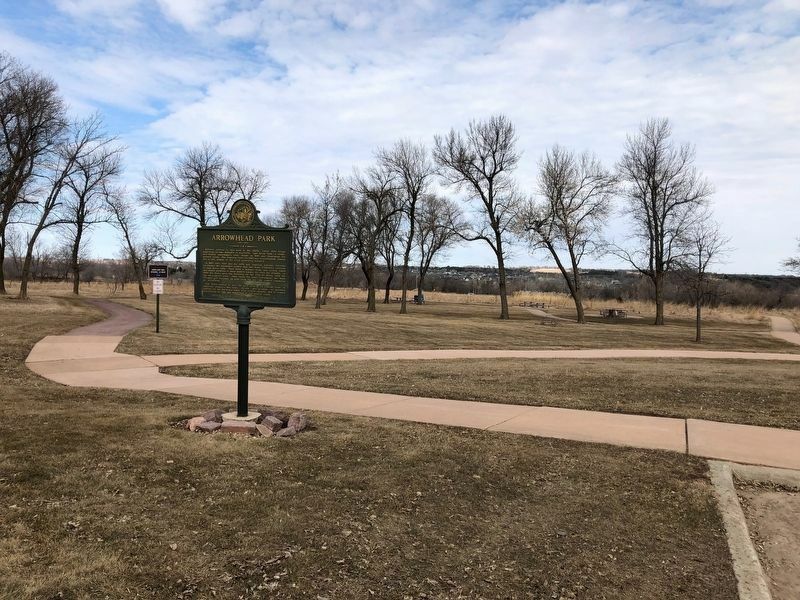 In 1982 Dale Weir and his wife and business partner Dorothy purchased the attractive prairie that had been O'Hanlon's Addition to East Sioux Falls. They built a summer home and access roads and added aerators to keep quarry waters ice free for wildlife. In 1999 the Weirs gave the property to the City of Sioux Falls for use as a nature park. They chose the name "Arrowhead" for their 131-acre gift because, as seen from the air, one quarry resembles an arrowhead. The Weirs wanted to save the park area in its natural state, to carefully preserve the trees, shrubs, and grasses, to maintain habitat for the birds and Many wild prairie animals, and to ensure populations of fish and waterfowl in the quarry ponds. the trees, shrubs, grasses, and flowers native to the region are found in the park. Trees include the eastern red cedar, cottonwood, boxelder, burr oak, and ash, together with a myriad of other smaller plants and wild flowers. Interesting geological features are found in the varied colors of the bedrock quartzite and in the variety of stones and boulders left by glaciers during the Ice Age. Another attractive feature of the park is the unusual 1888 barn which served as a stable for the quarry company. It is believed to have been designed by the famed architect Wallace Dow. Because of the vision and generosity of Dorothy and Daile Weir in choosing to give this unique area to the people of this region, succeeding generations will be enriched . Children will have an ideal place to learn about nature and local history, and those of all ages will have a place to experience solitude and to relate to the natural world. The people of Sioux Falls owe to the Weirs a lasting debt of gratitude. 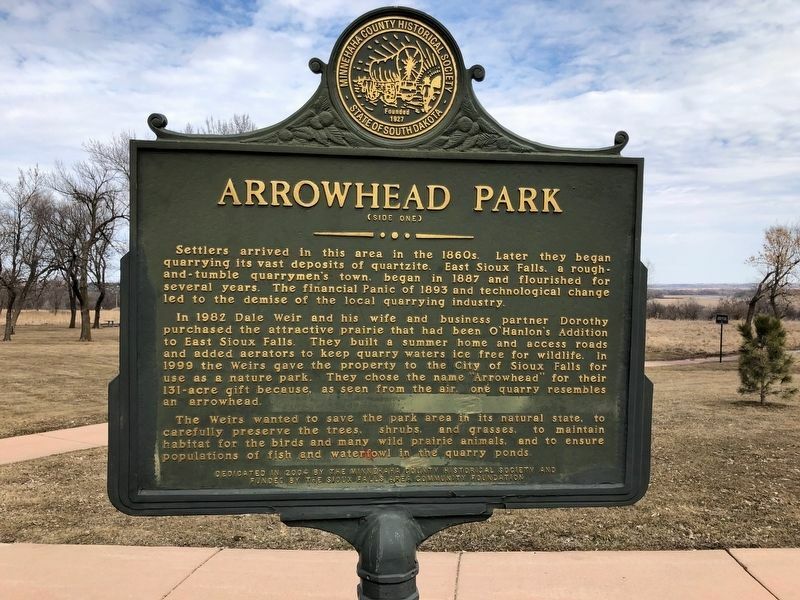 Erected 2004 by Minnehaha County Historical Society and funded by the Sioux Falls Area Community Foundation.
. Marker is at the south entrance to Arrowhead Park. Marker is at or near this postal address: 2310 S River Bluff Rd, Sioux Falls SD 57110, United States of America. Touch for directions. Other nearby markers. At least 8 other markers are within 6 miles of this marker, measured as the crow flies. The City of East Sioux Falls (approx. 0.2 miles away); Helen Gale McKennan (approx. 5½ miles away); Sioux Falls Municipal Band (approx. 5½ miles away); Lady Liberty (approx. 5.6 miles away); Pillars of the Nation (approx. 5.6 miles away); Lost Bird (approx. 5.8 miles away); Illinois Central Depot (approx. 5.8 miles away); The Government Building (approx. 5.8 miles away). Touch for a list and map of all markers in Sioux Falls. More. 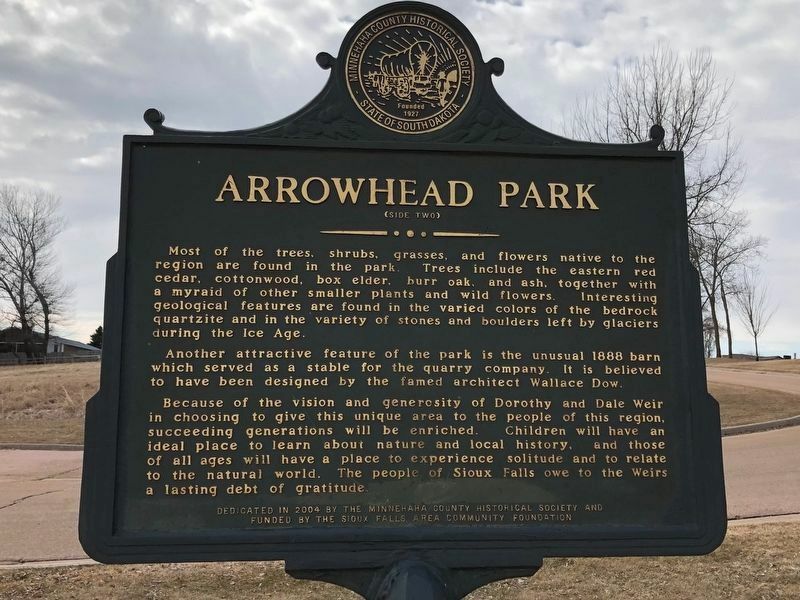 Search the internet for Arrowhead Park. Credits. This page was last revised on April 14, 2019. This page originally submitted on April 10, 2019, by Ruth VanSteenwyk of Aberdeen, South Dakota. This page has been viewed 39 times since then. Photos: 1, 2, 3. submitted on April 10, 2019, by Ruth VanSteenwyk of Aberdeen, South Dakota. • Bill Pfingsten was the editor who published this page.